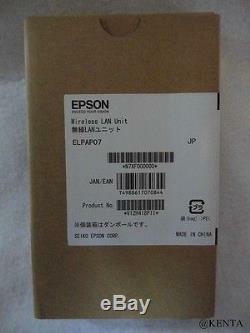 New EPSON projector wireless LAN unit ELPAP07 From Japan F/S. Wireless LAN unit for Epson business projectors. Compatible models EB-X 24 / W 18 / X 18 / S 18 / S 03 / EH-TW 410 / EB- 1776 W / 1771 W / 1761 W / 1945 W / 1965/1410 WT / 435 W / 430/590 WT / 585 W / 580/485 WT / 485 W / 480 T / 480/426 WT / 436 WT / 935 W / 965/950 W / 940/4950 WU / 4750 W / 4650 / G 6750 WU / G 6550 WU / G 6250 W / G 6050 W / G 6350 / Z 8450 WU / Z 8455 WU0 / Z 8350 W / Z 8355 W / Z 10000 / Z 10005 / Z 8150 / specifications compliance: IEEE 802.11 n / IEEE 802.11 g / IEEE 802.11 b use frequency: IEEE 802.11 b 2.4 GHz band (1 14 ch), IEEE 802.11 g / n 2.4 GHz band (1 13 ch) assumed interference distance: 20 m following communication modes: infrastructure, ad hoc /. About other area, please ask me. We do not mark merchandise values below value or mark items as "gifts" - US and International government regulations prohibit such behavior. 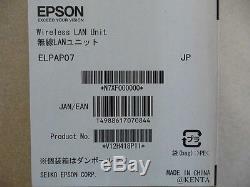 The item "New EPSON projector wireless LAN unit ELPAP07 From Japan F/S" is in sale since Friday, May 8, 2015. This item is in the category "Consumer Electronics\TV, Video & Home Audio\TV & Video\Home Theater Projectors". The seller is "kenta_takam" and is located in saiatamasi minamiku.